»Personality: Jewel is fairly bubbly and carefree, not seeming like the kind of person anyone could hate right off the bat, unless you found her annoying. Then that's your problem. In any case, she really likes people and Shinigami, and seems very extroverted. She has another side though, and that's angry. When she's angry, you know she's angry. She will yell, throw insults left right and center, and is generally a nasty person. The only 2 people she would never do this to are her Husband and her Daughter. To them, it's a silent rage, but her anger get's across. Quincy- See's them as "Protector of the Common Folk", and tends to go as far as to try and seek some out when she thinks a Hollow may be in the area, but always comes up short. Her Daughter and Husband- She loves her Family, despite the fact that her daughter was an accident. She would go out of her way for them, even to the point of self-sacrifice, though it's never come to that. Yet. Hollows- She's been attacked a bunch, all of which were hell-bent on killing and eating her or her family. So naturally, she's grown fearful of them. People who threaten her family- She loves her family, and if she ever met someone who had purposefully threatened them she would make an attempt to kill them. Well, maybe not actually kill them, unless it was that bad. Just yell at them if it's minor. Her "Stay at home mom" status- Jewel doesn't work, so she's a stay at home mom. She doesn't like people calling her that, though. It makes her sound weak, and useless, which she very much isn't. »Appearance Description: Standing at a tiny 4 foot 6, Jewel is very rarely seen without her newsboy cap. Her hair reaches down to her small shoulders. She likes to wear a very dark blue shirt, with a white undershirt. She wears baggy jeans, and blue running shoes that she's had for a long time. Besides that, she's painfully normal looking. She doesn't have many pockets on her jeans, and often complains about it. She also carries around a purple hand bag that she got for her and her husbands 10th anniversary. »Historical Information:Jewel was a nice young lady growing up, always eating her vegetables and what not. At about 6, she began to see spirits. She had told her parents, but they didn't believe her. So, she continued to talk to them. Some of them wore black robes, and when she talked to them, they were really nice. One of them even said he was a Prince! When she asked to read a book about royalty, she learned about him. Kazangan was his name, and she had learned a bit about him, though she never saw him again. Skip ahead a few years to the age of 15, and you'll see her pregnant. Yup. She and her boyfriend were having an accident child, and to her relief, he stayed with her. Her parents, while angry, didn't kick her out. Jewel became more restless, however. She had been seeing some spirit monsters, Hollows. She knew the name from the Black Robed people, or Shinigami. She knew they were dangerous, but they never did any harm. However during her pregnancy, she had a close encounter with one, and almost died. Thankfully, a Shinigami had come to her rescue just in time. Shortly after giving birth to her daughter, who she named Geminy, she met someone who called themselves a Quincy. She didn't learn much, but she was told they were the "Defenders of the Common Human." She made no mention of the Shinigami, as they seemed to be doing a good enough job killing the monsters. Jump forward to the age of 20, and you'll be getting Jewel's wedding day. Some of the Shinigami she had met along the way had been guarding the wedding to make sure no spirits attacked. Afterwards, her newley-wed husband dragged her off to a "Haunted Mansion." That's where she saw a ghost man, chained to the ground with a hole in his chest. She let out a blood curdling screech, as the man became a Hollow. Her Husband tried to calm her, but it was to late. That's when she saw an Arrow fly into the mask, and the Hollow drop dead. She didn't know where the Quincy was, but they had saved her life. Now at age 30 but not looking a day over 25, she lives with her daughter and husband, in a nice home. She tends to try and avoid Hollows as much as possible like she should, but does talk with Quincy, and Shinigami, not knowing about the other things such as Vizard, Arrancar, and Fullbringer. During her life, she has noticed her daughter being particularly found of a Mirror, but that's a story for another day. Welcome new users! 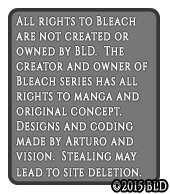 Thanks for choosing this site out of the many bleach role play sites there are to offer. If you are not new, welcome back! We are currently in the middle of a grand opening where several spots for races are still open and ready to take. Upon this the first 5 users to full register and get everything approved will get 10,000 Yen right off the spot! Wow! If you have any questions feel free to message any of the staff members. If you need help perhaps the navigation widget over to the left may help. Thank you for reading this, hope you have a fantastic day, also more events will be coming soon so stay tuned!